she who eats what she who eats ate. it's hot. it's like africa hot. can't think, won't cook, thank you thank you tokyo mart for the new shipment of kinu tofu, 'cause now i can have what chika's eating. a warning: the endless loop: you could be stuck in these two posts forever. 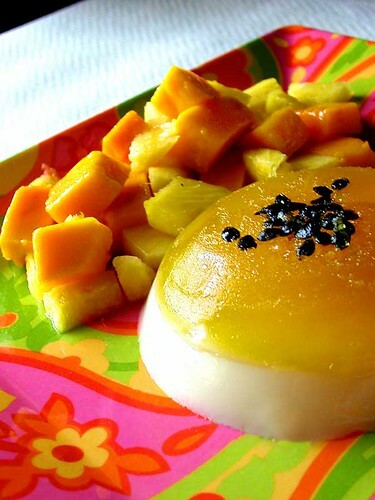 passionfruit jelly and soy milk pannacotta with fresh mango and pineapple. vegan, since it's made with agar, and easy, easy, easy. 1. bring the passionfruit pulp thinned with about 1/4 c water to a boil. sprinkle agar on 1/4 c of cold water and leave until softened. add to the passionfruit pulp, and return to a boil, stirring constantly. 2. pour into molds or glass bowls and leave until cool, then refrigerate until just set. 1. bring 1 c of the soymilk to a boil. sprinkle agar on remaining 1/4 c of cold soymilk and leave until softened. add sugar to taste, and return to a boil, stirring constantly. 2. leave until cool, then pour onto the just set passionfruit layer. refrigerate until set. unmold to serve. 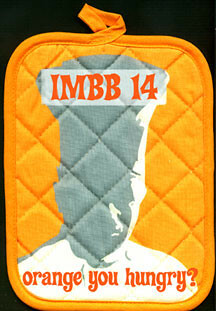 foodgoat hosts this edition of imbb, and the theme is orange! 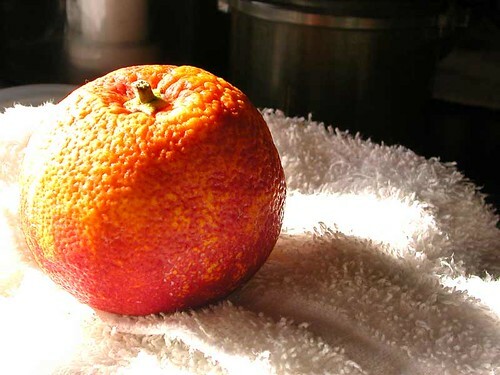 we guamish folk love our orange food--we have orange rice, orange turnovers, and orange stews, mainly due to a staple of the chamorro kitchen, achote--better known as annatto, or achiote. the orange colour comes from the seeds in the pods of bixa orellana (no, not the guy from einstürzende neubauten--although, ha! he was a bad seed), which was supposedly brought over to the island during the spanish exploration days, but has been documented in ancient legend, so i can't say that it was used in emulation of the spaniards' predilection for saffron, but maybe it was. if you know, let me know. 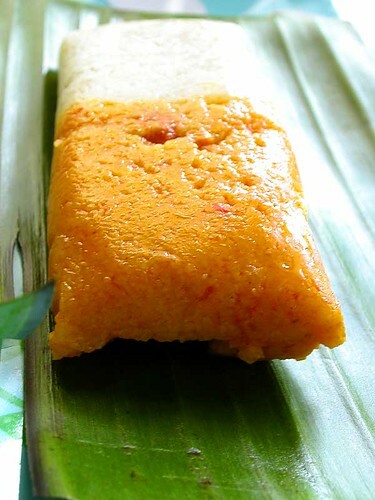 tamales, certainly, were brought over by the explorers, as versions of this are found all throughout latin america and in the philippines, down to the creamsicle-y half orange-half white aspect. made from masa harina and chicken broth, then steamed in banana leaf wrappers, these little savoury gems are a little more work than i am willing to tackle, so these were made by my friend's auntie. thank you auntie! they were delicious. and thank you foodgoat and lady goat, for hosting this time around. 1. soak achote seeds in 1 c of water until colour has been extracted, usually overnight. discard the seeds. 2. sautée the bacon, garlic, and onion until transparent. add the achote water. add the chili peppers, salt, black pepper and a cup or two of chicken stock. bring to a full boil and slowly stir in the cornmeal until a thick paste has been formed, roughly 10 minutes. 3. dilute cornstarch in 1 to 2 c water. stir in cornstarch mixture and simmer for a few minutes, stirring constantly. remove from heat and stir occasionally. 1. sautée the garlic and onion until transparent. add salt and a cup or two of chicken stock. bring to a full boil and slowly stir in the masa harina until a soft paste has been formed. 2. remove from heat. cool both mixtures. 1. wrap a couple tablespoonfuls of red tamale mixture next to a couple tablespoonfuls of white tamale mixture in a banana leaf or foil. secure well, then steam until cooked. 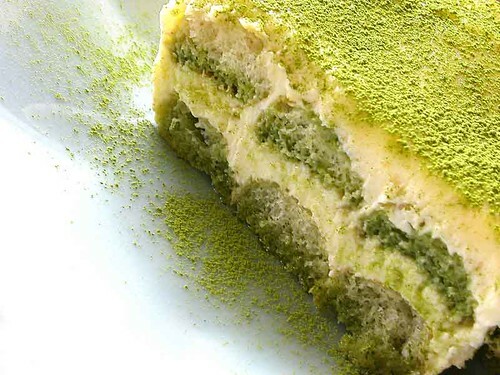 a classic tiramisu recipe, made not so classicly with matcha, japanese green tea, and a touch of cointreau. 1. beat the egg yolks and sugar in a bowl set over pan of simmering water, until the mixture is pale yellow. add the mascarpone cheese and beat until smooth and creamy. 2. in a separate bowl, whip the cream. add vanilla and orange liqueur. 4. fold the mascarpone mixture into the cream until blended. 6. dip ladyfingers into the brewed green tea, then layer them on the bottom of a serving dish. spread the creamy stuff on top, and repeat layers. 7. refrigerate at least a couple of hours; 24 is nice. 8. dust with powdered matcha just before serving. update 04 october 2006: some talk in the comments about the actual source of this recipe--more about this in this post. this was a flukey experiment because i woke up really wanting pineapple with basil-mint sugar, which is proven lovely but the only fresh herb i had was rosemary, so hooo. it was interesting. herbal sugars are fun and inexpensive culinary additions to play with; all you need is sugar and herbs and you can go to town--minty sugar on citrus fruit in the morning, lemon myrtle sugar with tea at noon, or perhaps a lavender sugar on a chocolate cupcake for dessert. fresh is usually the way to go, but you'll have to experiment with proportions and perhaps preparation. since this was a spur of the moment thing, i just finely chopped up some fresh rosemary along with white caster sugar, as i normally do this with mint or basil. the aroma was wonderful, and at first taste, i was pleased. however, because the herb was so pungent, it began to leave a medicinal aftertaste. i think next time i try this, i will make the sugar in advance, infusing the flavour slowly, like vanilla sugar, for a mellower effect. not that it was a complete loss. 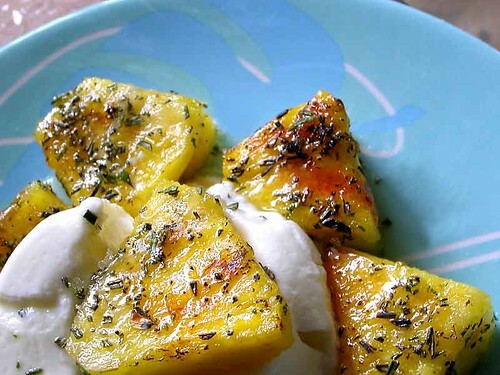 i am never that far away from my blowtorch, so i torched the pineapple and sugar, which did it a world of wonders--the rosemary mellowed out, and the burnt sugar and caramel worked well with the intensified pineapple taste. i threw in some yogurt cheese and had me a fine, fresh feast to start my sunny day. 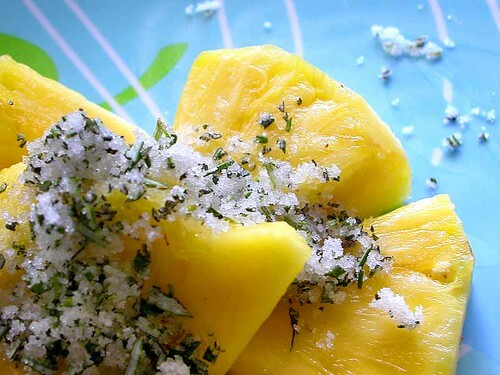 mush everything together in a mortar and pestle, or sprinkle the sugar on the herbs while chopping to help facilitate the process. place the rosemary branches into a tall, wide mouthed jar upright. pour in enough sugar to cover the rosemary completely, close jar tightly and keep in a cool, dark place for one or two weeks, shaking gently if you remember, but no worries if you don't. line a strainer or colander set over a bowl with several layers of cheesecloth, or a clean kitchen linen, or several layers of a good paper towel. dump the cheese in, leave it to drain overnight in the fridge. in the morning, discard the whey, squeeze out a little more liquid from the yogurt. they say you can use it like cream cheese, but i've never had it come to a proper consistency for that, so try it with fruit and/or cereal, or on top of a warm cake or muffin. 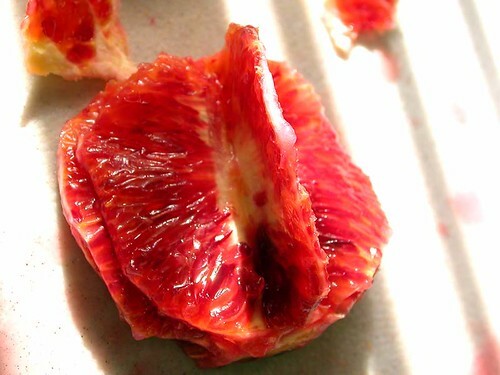 imbb 14: orange you hungry? the esteemed duo of foodgoat and ladygoat host this month's is my blog burning?, the theme: orange you hungry?, which is fantastically not just about oranges but of all orange-hued food. eeeeep! foodgoat is a great blog, this is a great theme, and orange is the new pink, bebes, so start thinking--the deadline is sunday april 24th. 1. place the water, soy sauce, sugar, and mirin in a shallow pan over medium low heat, allowing the sugar to dissolve. bring it to a simmer, and allow the sauce to reduce. 2. cut the luncheon meat into 1/4" inch slabs, and dip into the sauce, coating on both sides. remove the sauce from the pan, and brown the luncheon meat. 3. place the cooked rice into a ringed mold, cookie cutter or small can and tamp down lightly but firmly. you want the rice to hold together, but you don't want to smoosh it. sprinkle the rice with furikake, if you have it. unmold. 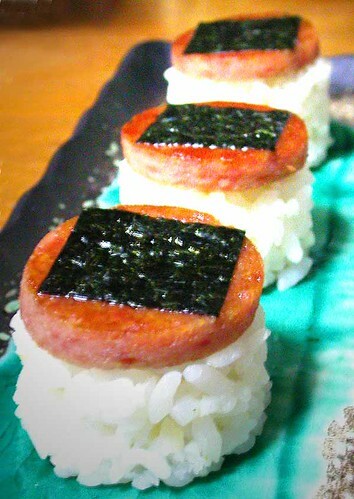 4. cut the browned luncheon meat with the same mold or cutter used for the rice. lay the cut meat on the rice, and brush some of the simmered sauce on top. 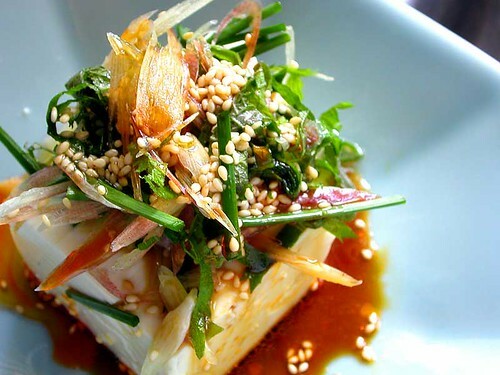 if you are using nori, cut a square of nori to fit the top, and add as garnish. 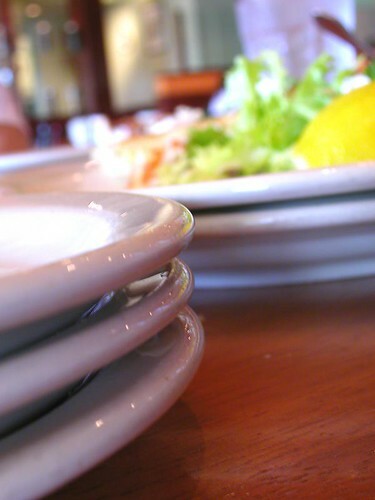 when i go out to eat, i have an uncontrollable urge to stack all the plates on the table. 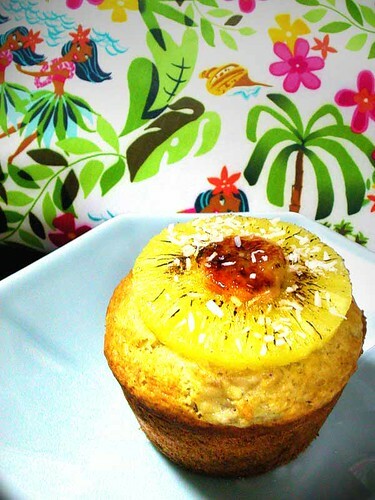 mondo tropicaux au go go (avec noix de coco): a big, big muffin with bananas and coconut, topped with a pineapple ring, brûléed banana, and a light dusting of more coconut. i cribbed the name from laurie's imbb entry, but it's not the same muffin 't'all (although hers sounds really lovely, once translated). anyway, it sounds much better in french, mais oui? bananes, ananas, et coco oh my! the recipe is basically adapted from jill dupleix's banana muffins recipe, but i added an extra banana to the two in her recipe, 50g of dessicated medium flake unsweetened coconut (the one that looks like dandruff, not the sweet stringy stuff), omitted the cinnamon, and baked it in one of those jumbonormous muffin tins. generally, i stay away from giant muffins, but i really, really, really wanted to put a pineapple ring on top, so jambo-jumbo it was. for the topping, i added the pineapple ring halfway through the baking time, about ten minutes in, although in the future, i might add it earlier so it sinks in a little more. the reason i didn't add it at the beginning of baking is because i thought the ring might sink to the middle, which wouldn't get me anywhere. after baking and cooling, i stuck a slice of banana in the middle of the pineapple ring, sprinkled some sugar on top and blowtorched it until browned nicely, then sprinkled more coconut on that. the texture is much lighter than most of these stodgy big things are, with a finer crumb than i see in most muffins. the flavour of the cake is wholly dependent on how good your bananas are--look for the sweetest, gloopiest bananas you can find. the pineapple adds a nice, fresh counterpoint, and the brûléed banana is just a bit of fun for you, and you alone to enjoy. unless gwen stefani asks for it, and then i suggest you give it to her because why? holla! B - A - N - A - N - A - S !!! sweet potato seasoned with harissa (a north africa chili and spice paste), baked with an egg, and topped with breadcrumbs. this is actually an entry for bomtoe #1: beginning of the month toast on egg, but because that doesn't actually exist, i'm sneaking this in to eomeoteo(ohweeohweeoh)#5, hosted by the most passionate of cooks, why it's the passionate cook, with the salvo that if you dump this on the floor upside down, it would be well within the guidelines. 1.prepare the sweet potato for baking, and bake in a preheated oven at 200C/Fan 180C/400F/Gas Mark 6 for 40-50 minutes until sweet potato is tender. 2. wrap the base of the potato in foil, then cut an 'X' on top. scoop out the flesh and mix with the harissa or chili sauce to your liking. return mixture to potato, making a little well in the middle. 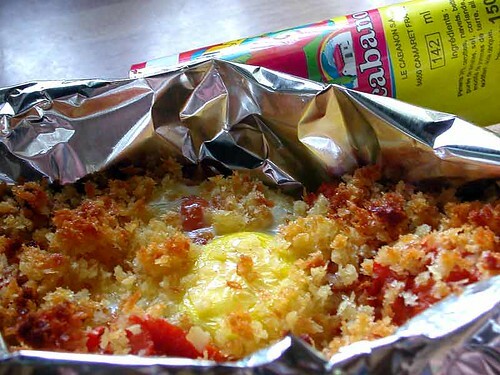 3. crack egg into the well, then sprinkle the top with panko bread crumbs. drizzle with melted butter or olive oil. 4. continue baking for 8 to 10 minutes until egg is cooked to your preference. 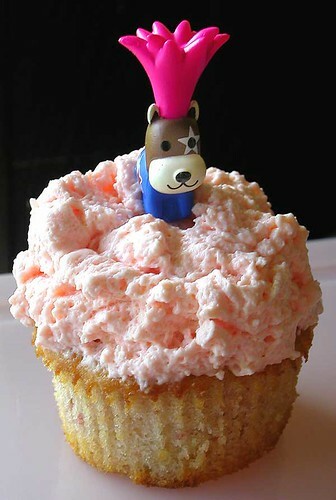 a fresh strawberry cupcake with whipped strawberry yogurt frosting. it was inspired by bowb's fabbo blog, raging yoghurt. why does her yoghurt rage? it doth not rage for me. the all cupcakes, all the time girls got to this cake before me--literally--and have the scoop on the yogurt frosting. i don't know why i'm so fascinated by this but i am. 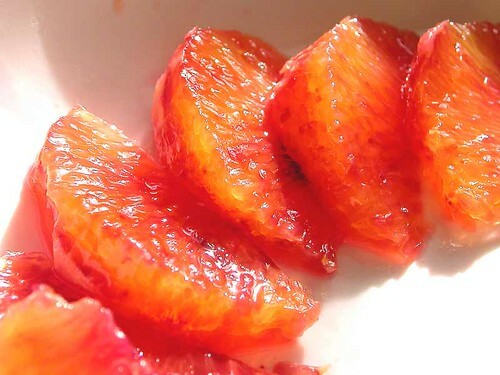 you know those citrus segments you sometimes get that don't have all the pithy rind on it? they actually have a name: supremes. isn't that crazy? i think it's crazy. 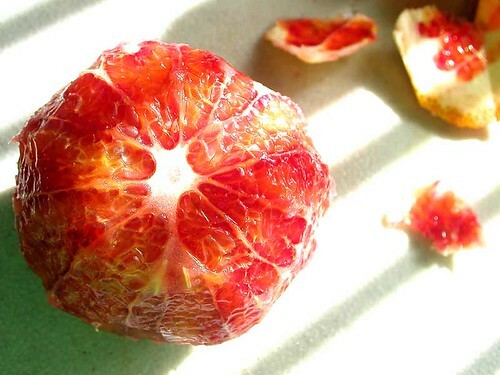 1. cut the top and bottom off of the rind. stand the orange on one end and cut down the sides to peel the orange. remove as much of the white membrane as you can. 2. use a sharp knife to cut the orange segments at a slight angle between the membrane and lift the segment out carefully. 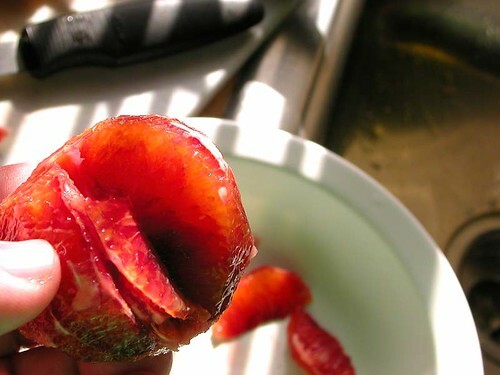 3. squeeze out any juice from the remaining carcass. ladies and gentlemen, i give you the supremes!